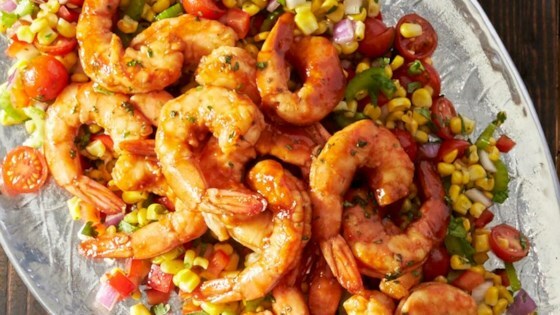 "Marinated shrimp grilled in foil packets with barbeque sauce are served with a colorful and refreshing citrus corn salad." Clean and remove shell from shrimp (leaving tail on). Place marinated shrimp on sheet of Reynolds Wrap(R) Heavy Duty Foil, pour BBQ sauce over shrimp, fold aluminum foil up and fold over twice; fold each end. Leave enough room for air to circulate in packet. Place packet on grill and allow to cook 6 to 8 minutes. Citrus Corn Salad: In a large skillet over medium heat add corn and granulated sugar, allow to cook 8 to 10 minutes. Add ice and water to large bowl to make ice bath and pour corn into ice bath, drain in colander, pour corn back into the bowl and add the cilantro, celery, red pepper, red onion, grape tomatoes, lime juice, apple cider vinegar, sea salt and ground black pepper and mix together to incorporate. What was the measurement for the granulated sugar? And what would be the best to pair this wonderful salad with? This was fine. I would cut back on the amount of black pepper in both side items. Just really overpowered the dish for the family. I will definitely make it again, but next time I'm going to double the recipe!! the corn salad especially was really good. maybe try the shrimp on skewers? I have not made this yet; but it sounds like a dish we would really like. How much sugar is used for the Citrus Corn Salad? Didn't use the BBQ sauce, used fresh corn, huge hit in the house and just enough corn salad left for a lunch tomorrow. Made it as-is (but forgot to put the bbq sauce on it). Was very good.